Day 2 – What Type of Local Guide Will You Create? Welcome to Day Two! Now that we’ve talked about the inspirations behind creating your own local guide app, it’s time to explore which type of guide you should create. 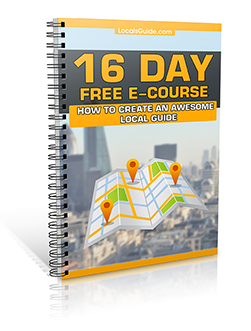 When looking to creating a local guide, you will quickly realize the options and opportunities are limitless. Having a general understanding of some current functions of guide apps gives you a starting point for deciding exactly what type of app you should create. Having reviewed hundreds of guide apps, we have seen everything from your classic city guides to cartoon guides and niche and specialty apps. Below is a list of ten common local guides that we will review in today’s lesson. One of the most common types of local guide apps created is the city guide. The city guide does exactly what it says it will do. These guides typically start with a broad approach and then organize information into smaller and more relevant categories. As a rule of thumb, large city guides are often very general due to the vast amount of information they cover, but valuable in the providing a big picture view. While a niche city guide may not provide you a list of post offices and bus routes, large city guide apps focus on covering larger amounts of territory. In some circumstances, city guides can be broken down into different districts or regions, thus allowing for more in-depth information. For example, a “New York City Guide” might separate Manhattan, Brooklyn, Queens, and each borough into its own unique guide within the overall guide. City guides are broader in scope and continually provide app users with the basic information to help them get around. City guide apps are all about breaking down a large amount of information into nearby and relevant results. In other words, they are usually more utilitarian in nature. Moving from a city guide to a small town guide is like zooming in on the map. Suddenly you take the big picture and you focus it on a smaller region. When creating a small town guide, you are able to include more detailed information, as well as more local tips and facts. People are often more passionate about their small town communities, and building a small town guide gives you the opportunity to share this with travelers. As a local you’re more likely to discover hidden gems in your town that strangers or large corporations won’t be able to. Small town guides become hyperlocal and allow travelers to see what it’s like to live in your community. Local town guides are all about helping app users feel more connected and knowledgeable about the area in which they live. 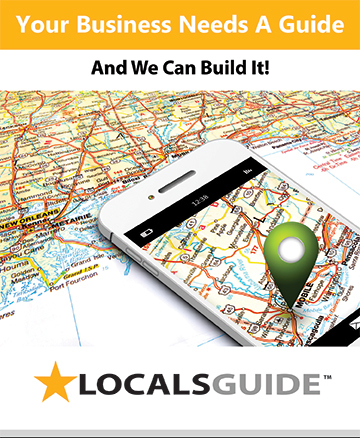 A regional guide can include many cities or towns and show app users what each has to offer. For example, an app about the Bay Area would be a regional guide, broken up into the different cities that form the Bay Area. Regional guides are more broad, especially if they are covering a large area. You want to include only the most popular local restaurants, beaches, or hikes. Although it’s a larger area, you still want to include tips and tricks that will make your users feel like a local. Find places that are tucked away that aren’t swamped by crowds of tourists. Regional guides are all about tying together a large amount of data into small, bite-sized chunks. Niche city guides focus in on particular interests within a town or city. For example, in the blog series Travels of Adam, Adam’s sole focus is to create “Hipster Guides” for his favorite towns and cities. Other niche city guides have been created for bike riders, foodies, coffee and wine lovers, and more. In the niche city guide Skate Savant, app owner Duncan Macnaughton shows hundreds of hidden skate spots around the world. Individuals have the ability to make purchases of individual city packs of the cities they visit. Niche city guides are exciting because you can create them about literally anything you want, and with location-aware results, users will always be kept up-to-date of what’s nearby. Niche city guide apps are all about meeting the need of a specific app user by providing them with unique and valuable local experiences. Much like a small town or city, many institutional organizations such as universities, museums, and city governments develop great local guides for specific groups of constituents and visitors. A university guide app can guide students around campus and the local area, inform them about available resources, or highlight student-friendly options in the area. Apps for cultural institutions such as museums can guide visitors around the premises, inform them of upcoming exhibits and events, and much more. No matter the institution, guide apps are powerful marketing tools that can help attract and retain new visitors and provide them with an unforgettable experience. People are always looking for things to do in their free time. Event apps that promote live music, theatre, and festivals are growing in popularity. While most event apps tend to cater to a particular interest group, general event apps are often common among larger media networks working to keep up with an ever-growing and diversified community. One of the greatest challenges facing these event apps is that the information expires quickly, and you always depend on a fresh source of correct and relevant information. Creating a centralized online submission platform is critical. Often, local event functionality is built into larger city or town guides, with user preferences to allow push notifications for specialized interest alerts. Local event apps are all about keeping users current with the latest and greatest nearby events. A walking tour guide is a type of audio tour guide, however, with a walking tour you are leading your app users on a walking adventure that isn’t necessarily directly related to museums or historical buildings. Unlike an audio guide that depends heavily on great content, walking guides are dependent on great vistas, hidden paths, scenic walkways. One of the main goals is to provide visitors with an experience that will have them feeling like a local as they explore your city. Walking tours need to contain enough detail so that people don’t get lost. Along the way you can also mention interesting local tips or highlights. Local walking tours apps are all about the journey you can create for app users – a journey that gives them an insider’s point of view and helps them to feel more local and connected. Have you ever been on vacation and wanted to find a nice local restaurant, but was unable to get away from the tourists? Creating a restaurant guide can give travelers that opportunity. It’s so much better to get recommendations about where to eat from a local. Have you ever been stopped by a stranger in your town who’s asked where the best Italian restaurant is? This is the perfect place to collect all your local knowledge and the collective knowledge of the community to create a detailed description of the restaurants in town. Creating a restaurant guide will also increase your community’s revenue as more places can become known. A restaurant guide is a foodie’s dream. Having the ability to learn about local restaurants, cafes, and bars is really exciting and makes travelers more likely to get out and explore your town. Tip: Creating a successful city guide will take a lot of hard work. Approach your project as a serious long-term endeavor and chances are you will experience great success. It’s important to remember that in the process of building your city guide, anyone else choosing to do the same will need to go through the same process. There is no shortcut for creating a great guide. In tomorrow’s lesson, we will explore elements of local guide design.